Here is the full-sized photo that provided the image for yesterday’s Super Crop Challenge #3. The insect in the photo is, of course, a fine example of a male Lucanus elaphus – the giant stag beetle (family Lucanidae). 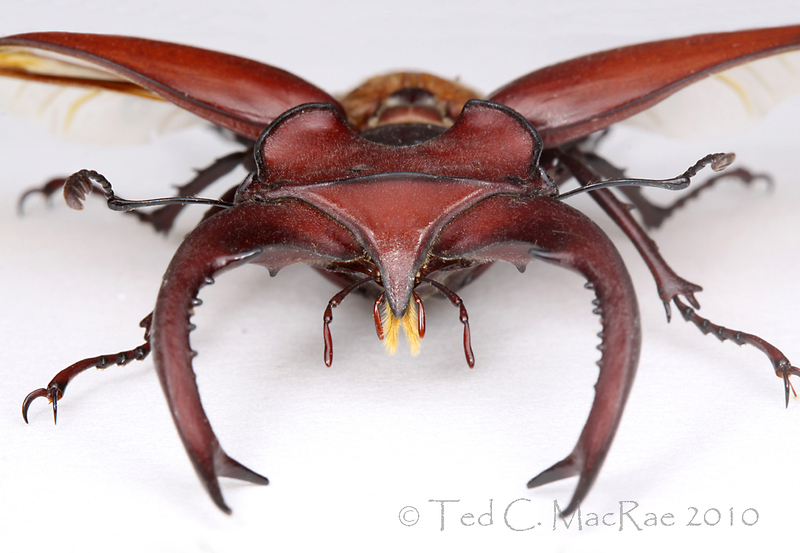 This striking insect is easily among North America’s most distinctive and recognizable species by virtue of the enormously super-sized mandibles sported by the males. Its fearsome appearance belies the true nature of this harmless beetle, which spends its days feeding on sap that flows from wounds on the trunks and roots of trees. Males use their massive mandibles in combat with other males, not for “biting,” but rather as tools to pry and lift their adversaries before dropping them to the ground. Some marvelous photos of this behavior in a related European species can be seen at Stag Beetles Lucanus cervus Mating Behaviour. I collected this specimen many years ago at an ultraviolet light (“blacklight”) that I had setup in the pine/oak forests at Pinewoods Lake, Carter Co., in the southeastern Ozarks – one of my favorite 1980’s beetle collecting spots. This was in my early days of studying beetles, during which time I was actively collecting material as part of my statewide surveys for the families Buprestidae (MacRae 1991) and Cerambycidae (MacRae 1994). 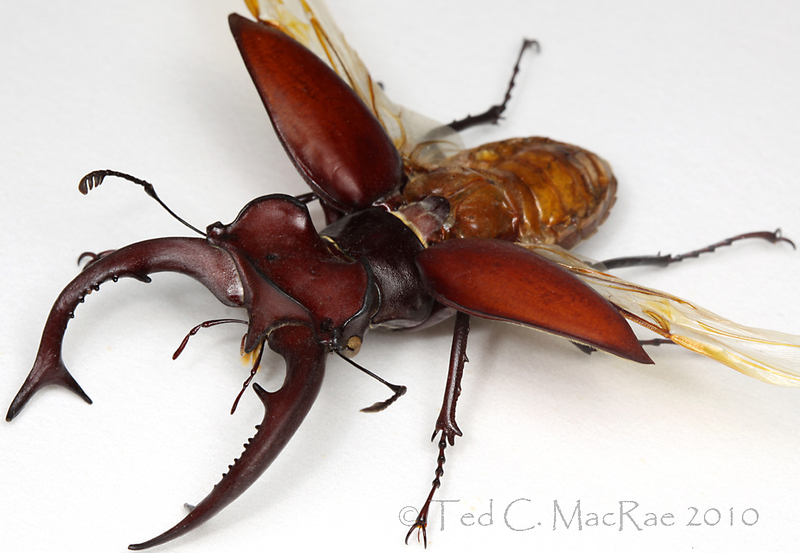 Lucanus elaphus is not a commonly encountered species, especially in the western reaches of its distribution here in Missouri, and I’ll never forget my rabid excitement when I encountered this fine major male at my blacklight sheet. For many years afterward it remained the only individual that I had ever encountered, until a few years ago when I came across a group of two males and one female feeding on a sap flow in a wet bottomland forest along the Mississippi River in the lowlands of southeastern Missouri. I encountered another male the following year at a nearby location “rafting” on debris in floodwaters from the nearby river, and two weeks later at that same site I picked up several males and females in a fermenting bait trap.¹ Like most “uncommon” species with broad distribution across the eastern U.S., I suspect that its apparent rarity is an artifact due to habits that make it infrequently encountered rather than being truely scarce. ¹ I have used fermenting bait traps to collect a wide variety of beetles, but especially longhorned beetles. My recipe is based on that described by Champlain and Knull (1932) – bring 12 oz. dark molasses and 12 oz. beer up to 1 gal. with water, mix well and add a packet of dry baker’s yeast to get the fermentation started. Hang a 1/2-gallon milk jug with big holes cut in the sides in a tree along the edge of a woods and add ~1 quart of fresh liquid. It generally takes 2-3 days for the liquid to really start fermenting and become attractive, and it will remain so for about another week or so. Check traps every 2-3 days by pouring the liquid through a kitchen strainer into another container – reuse or replace as necesssary. Place the collected specimens in vials of water to wash off the molasses residues, and either pin immediately afterward or transfer to 70% ethanol for longer term storage. Some of the more desireable species I’ve collected in this manner, besides L. elaphus, are Plinthocoelium suaveolens, Purpuricenus axillaris, P. humeralis, P. paraxillaris, Stenocorus cylindricollis, S. shaumii, Sarosesthes fulminans, Stenelytrana emarginata [= Leptura emarginata], and S. gigas [= Leptura gigas]. Congratulations to Ben Coulter and Janet Creamer, both of whom correctly identified the species and most of the mouthparts. Each earned 14 pts and, thus, tied for the win, while JasonC. earned 5 pts. to take the final podium spot. The pointed structure is the labrum (its shape distinguishing it from other North American species of the genus), and it is flanked on each side by the fuzzy yellow galeae (derived from the maxillae) and the labial palps. Nobody correctly named the galeae, which seem to be greatly elongated and hairy in stag beetles as a function of their sap feeding behavior. A portion of the left maxillary palpus can also be seen in the corner of the photograph, but nobody scored those points either. Brady Richards just missed the podium, but his witty reference to Gene Shalit (if not immediately picked up on by me) earns him an honorable mention. With points being formally awarded now beginning with the previous competition (ID Challenge #1), I’ll start keeping an overall leaders board, and with wins in both competitions Ben takes a commanding lead in the overalls with 23 pts, followed by Janet Creamer at 14 pts and TGIQ at 8 pts. I guess I should start thinking of some sort of tangible prize for winners periodically – suggestions welcome. Stay tuned for another issue of Super Crop Challenge or ID Challenge in the near future. This entry was posted in Coleoptera, Lucanidae and tagged beetles, entomology, insects, Missouri, North America's most..., quiz, science, stag beetles, Super Crop Challenge, techniques. Bookmark the permalink. A beautiful beetle. I was collecting aquatics once in the Sylamore Creek watershed in Arkansas when I saw two major males perched high up on a dead tree. I wasn’t keeping a pinned collection at the time, but I was sorely tempted to knock down that snag to try for the beetles. It’s been 17 years and I still think about them staring down and laughing at me. Oh, well. As for the honorable mention, thanks! I’m here all week. Try the veal. Awesome sight. If you could’ve watched longer you might have seen one drop the other one off – an ultimate natural history experience! Never could have guessed! Those are excellent photographs! Great series of posts. I love these beetles, and always seem just to see one or two per summer at lights, sometimes injured. There is one local car wash that seems to be reliable, and I’ve had one in my yard. (L. capreolus is pretty reliable in my yard–usually several per summer.) Phil Harpootlian tells me that L. elaphus are common in some areas he visits (South Carolina? I’m in the lower Piedmont of North Carolina.) I suspect we’ve had a few more Lucanus in my area for the last few years due to all the rotting downed trees from Hurricane Fran (1996), but I have no data to back this up. I would love to see the males battling in the wild. I presume all that action happens at night–any hints on finding them? 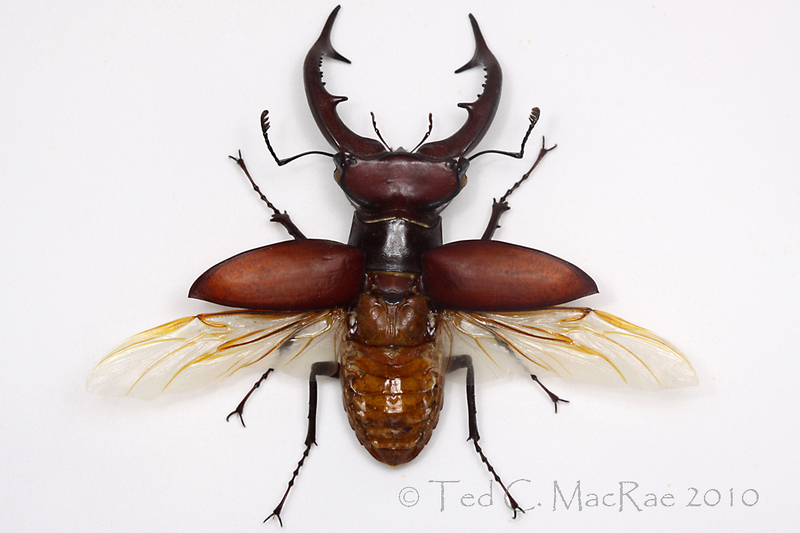 Lucanus capreolus is not uncommon here also, and I run into L. placidus occasionally (I’ve only seen it at lights). I almost always encounter L. mazama at lights on my trips out to the southwest. I’d love to see a battle between two L. elaphus males myself but don’t have any special insight on how to witness such an event. I’ve seen the adults active during the day, and this video of the European species doing battle was also taken during the day, so I don’t think this necessarily happens only at night. I’ll leave the guess work up to you guys, and just enjoy the info and excellent shots of your specimens. Always a nice treat to see your posts come in my email. Thanks! Oh… almost forgot, Happy New Year! Spectacular photos and I am soooo glad that I didn’t punt with (a) it must be an asilid, Ted likes asilids and they have beards, but those palps just aren’t post-nematoceran or (b) a completely loony hypothesis about an oil-collecting bee with brushes on its maxillae instead of tarsi I. How embarrassing would that have been! Oh well, another excuse to drink away what is left of 2010 and wish you and yours the best for 2011. Best wishes for an awesome 2011 to you as well, Dave! Magnificient beetle and photos, Ted. I’ve tried a similar brown sugar-based mixture here in se AZ to attract Megacyllene robusta and Crioprosopus – with various results. Thanks for the recipe and technique. Mega. antennata is common at lights here at various times of the year. Looking forward to your “red beast” (=Crio.> post. Yeah, there are a lot of species common in your area that get us easterners all excited the first time we run into them! I suppose it works the other way, too. Magnificent magnification of a magnificent beetle beast! Stunning photos are easy with a subject such as this one. I should’ve used the 65mm for a closeup of just the mouthparts, and then cropped a single brushy galea for the Super Crop Challenge – that would have made for a Super Crop Challenge almost as hard as Dave‘s! Thanks for another fascinating post! Your photos are so cool and I always learn so much. Hope you have a great 2011! Thank you, Janet. I appreciate your readership and kind remarks! Awesome beetle! What a treat to have observed them in the wild – sounds like you learned how to look for them. I suspect you are on to something regarding uncommon species. Happy New Year, Ted! Happy New Year to you also, Amber! I won’t feel like I’ve really “seen” this species until I witness a male battle in the wild. I live in Northeast Charlotte NC and encountered a big male (close to 3 inches) on the screen at the back porch. We have 1/2 acre of woods behind our house and have a yellow “bug light” on at night. Around midnight my wife comes up shrieking as if she saw the devil himself. I went downstairs and watched it for a long time as I instinctively knew this bug was special. I then googled “NC bug with antlers” and eventually found your site and pictures. I’m not into bugs at all but this one has changed my tune about the magnificence of these creatures! I live in Central Pennsylvania, and I just caught one last night! Was wondering what I could feed an insect like this! Would be very interesting to see just how long I could keep it alive! They feed on fermenting sap flows on the trunks of deciduous trees, so I would try sugar or honey mixed with water (10-20%) – either a saturated wad of absorbent cotton or painted on a stick or piece of bark. Beetles in this family are popularly cultured (especially in Japan), so I would imagine an internet search might turn up a lot of info on keeping the adults. A co-worker just found a stag beetle out back of our shop here in Indiana. It seems almost dead but I am trying to revive it with Diet Coke (the nectar of the gods, of course). It is about 1.5 inches long. Not sure how this little guy got here. A quick Google search doesn’t show many in the US. My aunt gave me Lucanus capreolus that she found inside her house. It was on her bed. I remembered going to Monsanto and meeting you. The little kid who gave you a Giant water bug that was five inches. I found this blog two days ago. Hi Levi, of course I remember you – and glad you found my website. Keep up the insect colleting!